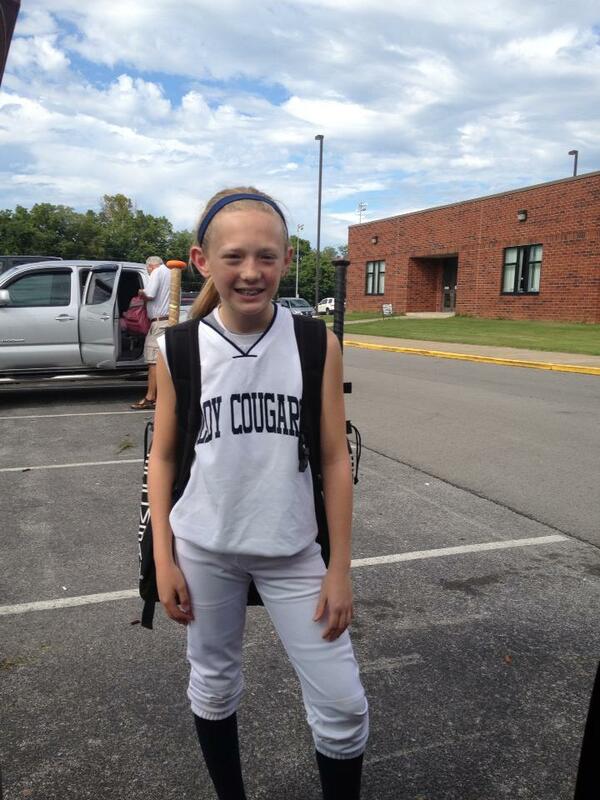 Stealing home for a one-run win and then banging out 14 runs in the first inning of the second game, the Logan County Middle School Lady Cougars won a doubleheader against visiting Franklin-Simpson Tuesday to start the season. Kaylin Page, who joins Abby Hinton as the only fifth graders on the team, came home on a delayed steal in the bottom of the fifth inning. She singled to open the inning and moved up on a hit by her cousin, Jordyn Belcher. With cleanup hitter Brea Croslin, a sixth grader, at the plate, Franklin’s catcher and pitcher had a brief bobble of the ball. Page raced home and slid in for the win. She touched the plate before the tag and had cleat marks on her leg plus a 4-3 win to show for her troubles. Page is accustomed to late-inning heroics despite her youth. In the national 10-and-under tournament in Bowling Green earlier this month, she hit a bases-loaded triple to drive in three runs, including the game winner, in a 5-4 decision by the Bowling Green Blitz over a Texas team. Hannah Cron scored Logan’s first run of the middle school game and of the season when she led off the first inning with a hit, moved up on Belcher’s sacrifice, and came home on Croslin’s first hit as a Logan County athlete after starting varsity for Russellville as a fifth grader this spring. Logan scored its other two runs in the second. Susanna Higgins was hit by a pitch with one out, and Kennedy Nichols reached in an error. 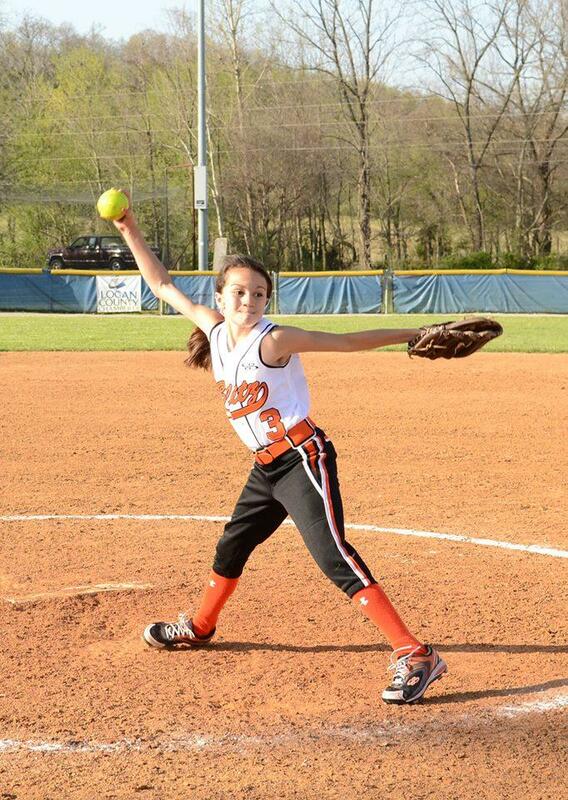 Sixth grader Sydney Lee singled in Higgins but Nichols was out at the plate. Rosie Kerchenski hit an RBI fielder’s choice, plating Lee. Page and Lee each had two hits while Belcher and Croslin each had a hit and a walk in the game. Higgins had a hit and was hit by a pitch. Teanna Gray added a hit. Lee, a sixth grader, pitched the win. She gave up three hits and walked six while striking out four. Leadoff hitter Sarah Beth Hale set the tone for the Lady Cougars’ big first inning of the second game. She had two hits and scored two runs. She also was the starting pitcher. Jillian McLellan doubled, singled and scored. Page and Belcher, who both doubled and walked, scored two runs each. Haleigh Duncan walked and then tripled in two runs as the last batter of the inning. Cron singled and was hit by a pitch, scoring twice. Higgins singled and scored while Croslin, Kerchenski and Nichols all reached and scored. Hale retired the first three Lady Cats batters of the game in order. The visitors scored two runs in the second inning, but the game was called in the middle of the second with Logan winning 14-2. The Lady Cougar roster includes three eighth graders, five seventh graders, three sixth graders and two fifth graders. Logan will be back in action Thursday against visiting Todd County, starting at 5:30 p.m.